In 2018, three Maine communities will host a show of prints by artists from Maine and Aomori, Japan. 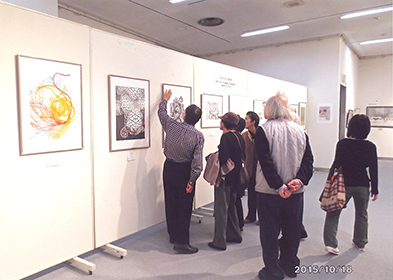 The traveling exhibition is part of MAPS (Maine-Aomori Printmaking Society), organized by Friends of Aomori as a cultural exchange program, sharing art and artists between the sister states of Maine and Aomori. 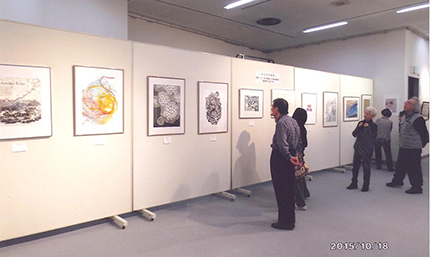 The prints will be exhibited in Green Lion Gallery in Bath, Arundel Farm Gallery in Arundel, and the University of Maine in Orono, while the same collection is exhibited at multiple locations in Aomori prefecture, from April to October. 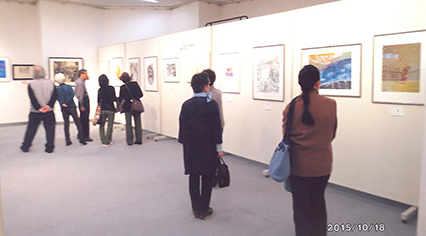 This 2018 series of exhibitions builds on the successful series of exchanges and exhibitions held since 2015 in both countries, now numbering thirteen shows in varied locations throughout both states. Coinciding with the inaugural 2016 exhibition, Pickwick Independent Press — an independent print studio located above the galleries in the Space Studios in Portland — hosted Japanese printmakers for a week-long printmaking residency. 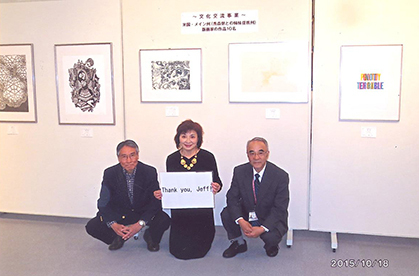 The residencies were supported by a grant from the Consulate-General of Japan in Boston, and included time for the artists to work in the studio, visit local galleries and museums, and deliver a workshop at Maine College of Art. 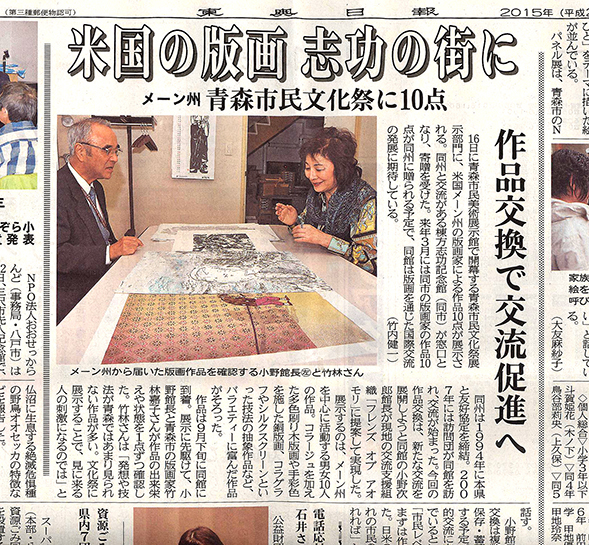 MAPS is organized by Friends of Aomori, an all-volunteer non-profit that supports the Sister State relationship between Maine and Aomori, Japan. The relationship between Maine and Aomori has been in place for 20 years, but the fascinating connection between the two states goes back to a shipwreck in 1889 (read more here: https://maine-aomori.org/about/). In addition to MAPS, Friends of Aomori supports high-school exchange programs, educational events and programming about Japan, and economic development opportunities such as a delegation visit of Maine fisherman and aquaculture business leaders to Aomori in October 2016. 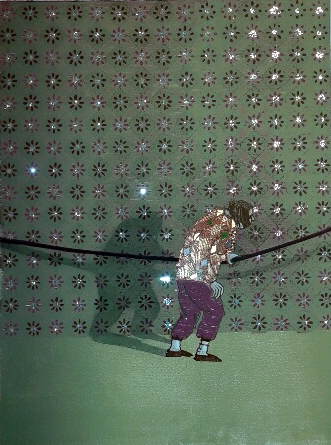 MAPS 2018 features prints by: Jeff Badger, Lyle Castonguay, Julie Crane, Rebecca Goodale, Don Gorvett, Adriane Herman, Charlie Hewitt, Isaac Jaegerman, Junji Kimura, Mitsuo Konno, Yoshiko Takebayashi, Tatsuo Maeda, Scott Minzy, Yoshiko Munakata, Akihiro Sakamaki, Hiroko Shibutani, Sadao Tanaka, Jaime Wing, and Seizo Yagihashi. MAPS will be on view at Green Lion Gallery in Bath, Maine from April 20th – May 19th, with an opening reception on April 20th; Arundel Farm Gallery from May 26th to June 16th with a reception on May 26th; and at the University of Maine in Orono from Oct 5th – Nov 16th, with an opening reception on October 5th. 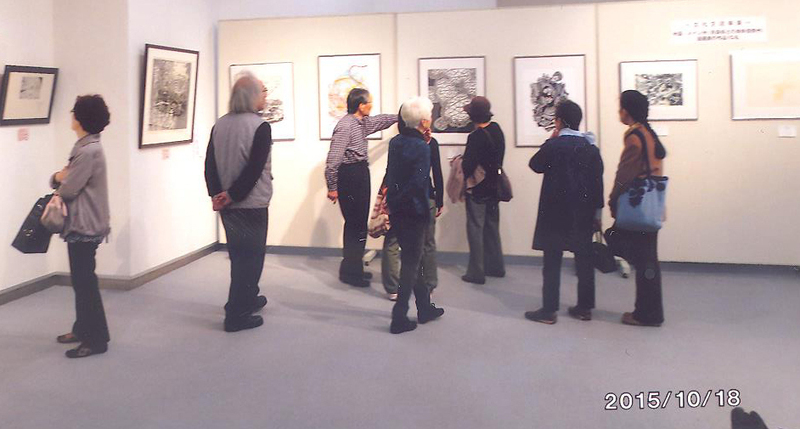 Printmaking workshops and social events will coincide with the exhibitions, Please visit the websites and Facebook pages of the galleries and Friends of Aomori for details. 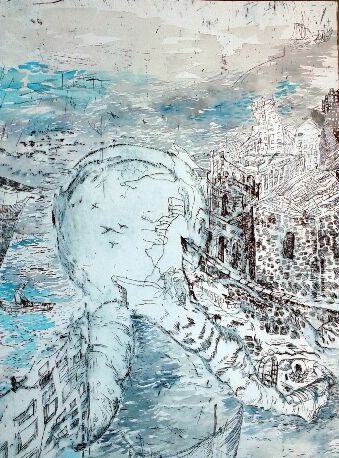 MAPS is made possible with generous support from Ocean House Gallery and Frame.